It dismays me to see the national media continue to fail on the most important issue a society has to deal with: war. You would think the Iraq War in 2003 would be Exhibit A of what not to do and a continued lesson for today’s journalists. Nope. 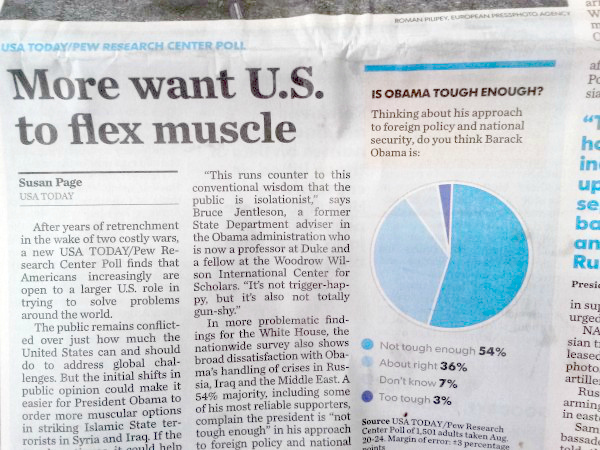 Here’s an insidious example from the USA Today. And one of the most persistently annoying facets of American political theatre is this idea of “toughness.” What the hell does that even mean? Not surprising that 67% of Americans view ISIS as a threat. The war drums are beating and with it, the typical fear-mongering that ISIS lurks around every corner in America and could detonate bombs at any moment. Despite one of the top counter-terrorism officials saying ISIS does not pose a threat to the homeland. Many think there are “sleeper cells” within the U.S. It’s just a joke. A “tougher” media is needed, I suspect. Almost as late as 2004, an overwhelming majority of Americans, Republican and Democrat, believed in a link between Saddam Hussein and 9/11. That nothing has changed about misconceptions and war nearly 10 years later, just…yeah. It’s frustrating, guys. ← Inside the mind of the girl who is TOO SKINNY.